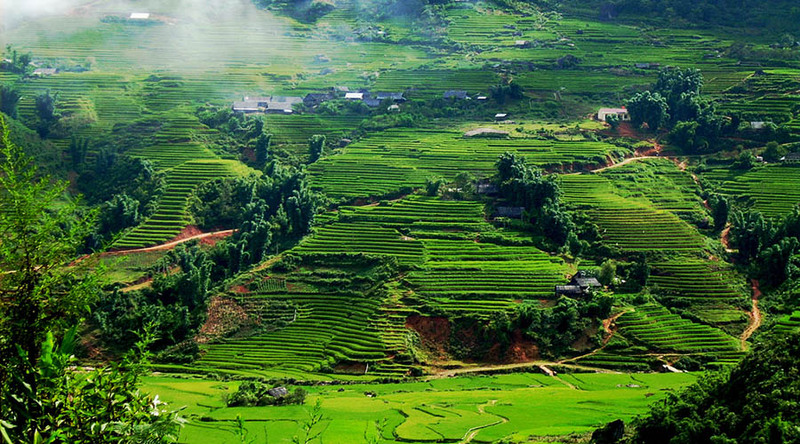 Well-known as the top highlight of Moc Chau district, Son La province, Moc Chau Plateau is featured with green tea hills, the widest and the most beautiful grass fields in the North’s mountainous areas. The Plateau provides tourists with a peaceful feelings and ecosystem experiences at the height of 1,050m above sea level. 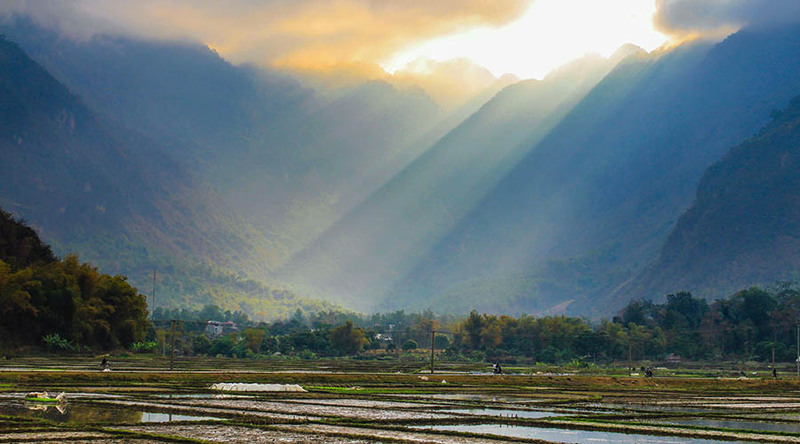 Mai Chau has been a pretty popular tourist spot, located in a valley surounded by spectacular mountains. 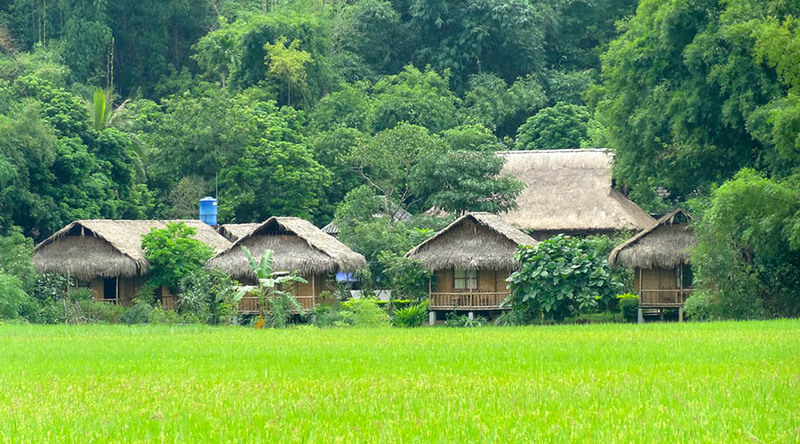 Coming here you will enjoy the peaceful atmosphere, visit the unique houses on stilts of the Thai ethnic minority and know about their lifestyles. 6.45: Our bus and tour guide pick you up at the meeting place then departure to Mai Chau. On the way, you will stop at Thung Khe mountain pass to see the imposing scenery of the North- West, take a short beak. 11.30: Arrive in the village of Lac – Mai Chau. 12.00: Have a delicious lunch with local food. 13.00: Our tour guide will take you to visit the beautiful poetic valley of Mai Chau, discover the interesting customs of the “white Thai’ ethnic minority and the ways they make their unique brocades and handicraft articles. 15.30: Keep going to Moc Chau, the land of the immense fields of tea and infinite variety of wild flowers. 18.00: Arrive in Moc Chau Arena Village, check in the room, have dinner with specialties of the North-West. After dinner, you can join in a important process to make good tea product, that is callled “dry tea in the pan”. After that, you enjoy a hot tea that was just made by your own hands. You can get up early to enjoy the pure peaceful atmosphere and sunrise. 11. 30: Back to Moc Chau Arena & have lunch. 13. 30: Check out, take the bus back to Hanoi. On the half way back to Hanoi, you have a short break. 17. 30: Arrive back to Hanoi, our tour guide drop you at the meeting place, say goodbye to you. See you next time.